Kappa is constantly researching innovation. The WA408 is a waterproof rucksack created for use on two wheels. K•LAB has designed this bag specifically for use while riding a motorbike, uniting both high visibility and a waterproof closing system. Roll-down closing system that guarantees the bag to be waterproof, allowing a comfortable and casual journey. Made entirely of seamless, high-frequency welded 500D tarpaulin PVC, with materials made in accordance with REACH regulations. 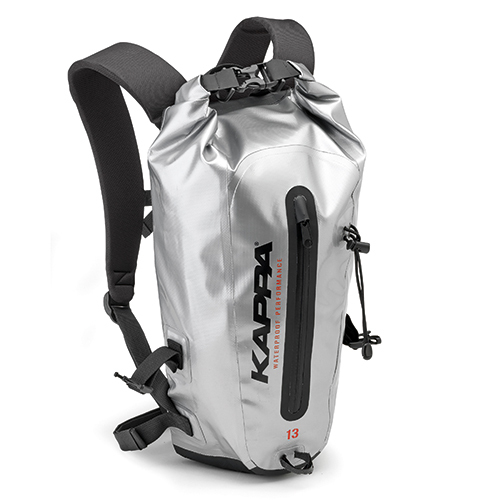 With its unique and unusual design, the rucksack is practical and versatile, perfect in any situation. • Bolsillo frontal con cierre (no 100% waterproof). Kit de fijación: elásticos incluidos, correa para el transporte como bandolera. Todos los materiales han sido realizados según la normativa REACH.